It took a while before I liked IWC. They are easy to adore, especially the classic looking models like the IWC Portuguese and Flieger. However, I always thought these watches were overrated. Asking almost 6000 Euro for a Portuguese Chronograph, with an ETA/Valjoux 7750 movement seems kind of optimistic. However, I must admit that IWC does a very nice job in finishing these fairly common movements. And of course, a watch is more than a movement. The finish on IWC’s watch cases and bracelets is superb as well. IWC also has a rich history in watch making and is one of the first watch factories to produce their watches ‘green’. In the case of IWC, this means that their factory in Schaffhausen uses hydro-powered machinery for the production of watches. Last year I bought this Ingenieur 3227-01 and since then, I have a subscription on their inhouse magazine (called Watch International) and try to keep track of IWC a bit more. 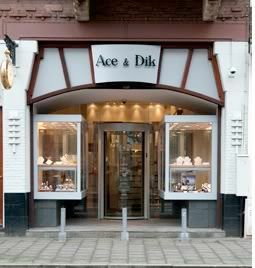 Ace Jewelers, friend of the show, lead by Alon Ben-Joseph, is having this annual IWC show in his shop in Amsterdam. 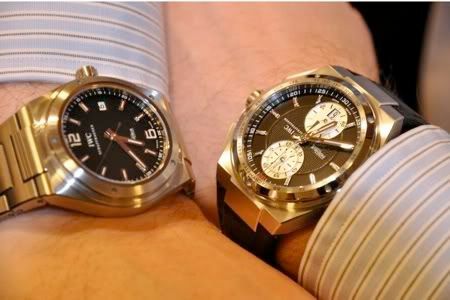 I posted only a few blogs on the SIHH 2009 and IWC, but mainly on the new Ingenieur Mission Earth. The new Aquatimer was a bit of a disappointment, at least that was I thought it was. Having repeatedly told Alon of AceJewelers that it reminded me about the Citizen diver watches, they are actually nice and impressive watches. 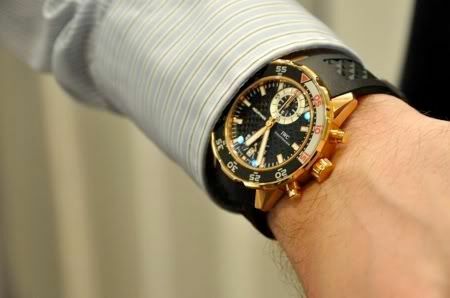 As you can see below, the Aquatimer actually looks quite un-Citizen-ish on my wrist. I admit I was wrong. Especially the case and dial are superb! The rotating bezel has this shiny finish which I really like. Perhaps this was also the case on the former Aquatimer, but I don’t recall that. Below you see the gold version again, next to the galvanized rubber model and stainless steel model. 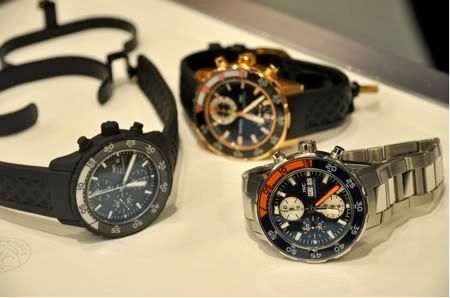 I do wonder what the use is of a chronograph on a diver’s watch, but who am I to question a diver’s tool watch. 😉 Another model that I followed with interest since its introduction, is the new Big Ingenieur Chronograph. It is LARGE, but when you do eat enough pan cakes, it will grow on you! The non-chronograph version was a bit of a disappoinment really, although looking nice at first glance, I noticed that the edges of the case were not as sharp anymore as on the discontinued 3227-01 Ingenieur. 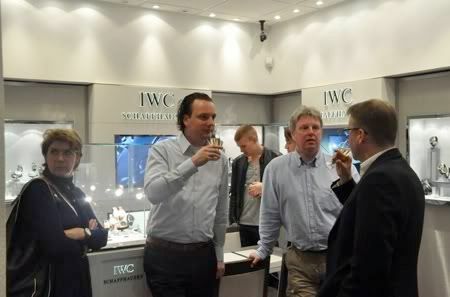 The crowd during the show was a healthy mix of people, all of them with a good interest in (IWC) watches. As you can see on the picture below, I’ve met with Rich Pontier, who took some very nice photographs (being a photographer) of the event and met some old friends like Bernard Werk (Watching magazine), Frank (Monochrome) and Ernie Romers (WatchUseek) and his wife. 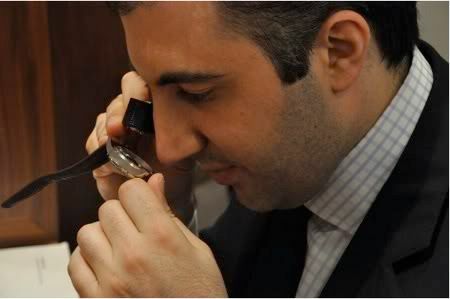 Host of the show, Alon Ben-Joseph (below) brought his family and his lovely girlfriend Chantalle (who was wearing a very nice Portuguese Chronograph in white gold). More pictures of the event can be found on Rich Pontier’s website. You will also find some great pictures of the IWC tourbillons and minute repeaters in his photo collection.